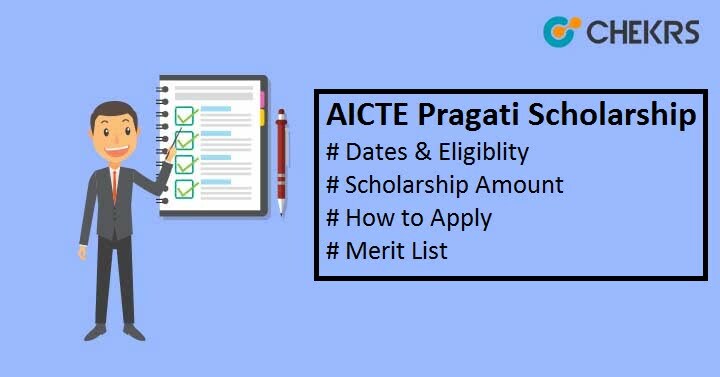 AICTE Pragati Scholarship 2019: The Scholarship has been maintained by All India Council For Technical Education for providing the scholarship to girls under the PRAGATI Scheme. The AICTE Pragati Scholarship will be provided to a single girl child of a family for pursuing Undergraduate and Diploma courses in the AICTE approved institutes. 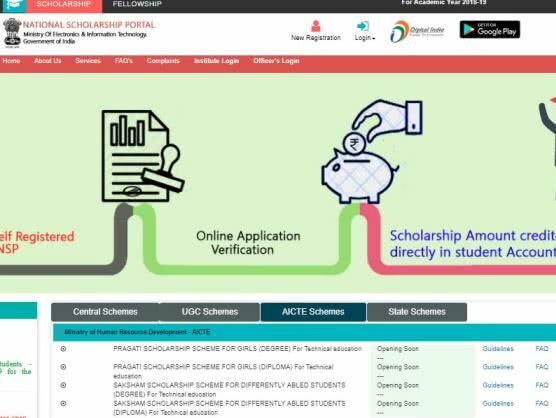 Latest Update: AICTE Pragati Scholarship has been listed on the National Scholarship Portal, So Maybe we will get updates in a better way from there. Which is really good as per students perspective. A total of 4000 AICTE Pragati Scholarship Scheme will be offered to the selected girl candidates in a year. To apply for the programme, eligible applicants must fill AICTE Pragati Scholarship Form through its official website before the last date. And that’s why we have repaired this article to provide complete details about Pragati Saksham Scholarship and its Eligibility, renewal, AICTE Pragati Saksham Last Date etc. All India Council For Technical Education provides AICTE Pragati Scholarship Scheme for girls to provide higher degree undergraduate and diploma courses. Candidates applying for it must meet certain eligibility and he /she must register themselves through its official portal. All the Basic details are Given Below. Make sure to go through it. Last year the last of the application was extended till 31st of October but the Date range of this Scholarship Application Availablity is given below in the table. Only a single girl per family will get the benefit of the scheme. The family income of the candidate must be less than Rs 8lakh per annum. 4000 Girl students will be offered the scholarship, 2000 for Degree and 2000 for Diploma. They Will Get Rs. 30000/- as tuition fee reimbursement and Rs. 20000/- as incidentals each year (2000/ month for 10 Months). Document Required to fill the AICTE Pragati & SakshamScholarshipp. Mark Sheet of 10th/ 12th or others as applicable. Annual family Income Certificate issued by not below the rank of Tahsildar. Admission letter issued by Directorate of Technical Education for the admission in Diploma/Degree course. Certificate issued by the Director/Principal/ Head of the Institute. Caste Certificate for SC/ST/OBC category (If Any). All the Eligible students must fill the Pragati Saksham Scholarship Form through its official portal by following the below steps. Candidates must register themselves through its official portal aicte-pragati-saksham-gov.in. Click on “Register Here” to create new profile. Enter the details and click on “Register”. Enter personal details under the Tab “Personal Details”. Institute details in which Admission is taken for first year Degree or Diploma. Also, Course and fee paid details under the Tab “Institute Details”. Enter 10th and 12th Standard details under the Tab “Education Details”. Enter the Bank Account details under the Tab “Bank Details”. Also Attach all the Scanned documents under the Tab “Attachments”. Which are listed above. There are also some reservation for the SC ST and OBC Category candidates. All are Listed Below. AICTE will select the candidates on the basis of AICTE Pragati Scholarship Merit List which is prepared as per performance in the qualifying exam. For more updates on AICTE Pragati and Saksham Scholarship 2019, stay tuned to our portal regularly. Share this Post and live connected on our social profile. when is the date for the renewal of 3rd year 2018-19 batch .please reply as soon as possible. Sir, do I get scholarship without doing renewal. I don’t renewal this scholarship because there is no renewal process sir. Sir its very important for me to get this scholarship.so please, suggest to get this scholarship sir. Hello Konkimalla udayasri chandrika!! There is renewal Process but due to some problem on the authority behalf. Neither the process nor the dates are really confirmed. Important thing is that the Scholarship scheme is also listed at https://scholarships.gov.in/ without proper information and with text Opening soon. So We can only wait. We also tried to contact the authority regarding this matter but we didn’t get any response from their side till now. So just wait, we are keeping eyes and will update this article with any new update and news. Thank You and Keep Visiting. I am m. Vijayalakshmi.I received pragati saksham scholarship in my first year.now I am studying second year.sir please say me how to renewal the scholarship for second year.For me this scholarship is very important for studying. I am requesting to respond to my message. Hello Vijayalakshmi! To know the Renewal Process. Visit the Website and Login there. You will get the complete information. If Not, There is also Contact to the officials, they will help and guide you for the further procedure. Thank you and keep Visiting. This is Vijayalakshmi.when I login into the website I am getting only my application form.then what is the process for renewal. Hello! Vijayalakshmi Will you please send me the page which is shown just after login. Send me Here sourabh@crazzleplus.com. You can use Fireshot on chrome to take a complete screenshot. Thank you I am waiting for your email. By the way, You can also contact any senior who get the same scholarship and renewed it. They can guide you better in this case. Hi sir, I’m DEVI. I got the pragathi scholarship in my first year. Sir how the renewal the pragathi scholarship is there any date to submission. From so many days I’m trying to renewal the scholarship but yet solved. Please give me information about the renewal of 2nd years..
How can we renew the application form of pragati scholarship where we belong to 2017- 18 batch ? Sir, what is the renewal date of 2017-18 batch for Pragathi scholarship.please kindly respond my message. Hi Bhagya! There is no Official information about renewal dates. If your problem has not been solved yet, Try RTI. Thank You. Sir, I explained my issues and attach to list where my name present in the list and the message send to higher authority sir but l can’t get any replay to authority sir and the message was send in the 1st November. Please kindly respond my messages. Sir,i applied pragathi scholar ship in 2017-2018,when the results are announced,my name is in the list ,but i can’t get scholar ship till now,what i’ve to do now?and renewal date of 2017-2018 batch please tell me sir. Hope It will help. Thank You and Keep Visiting. Sir,i explain my issue and attach the list in which my name is present,the message is send to authority sir email id.But i have not any replay to the authority sir,please kindly resond my message. Hi Bhagya! I am glade that you replied back. I want to know “When you have sent the email?” If you have sent just one or two days back, Just wait for some more days. Because the authority receives hundreds of emails and queries daily, So it will take time. Now if it takes too much time, then i will suggest you to either directly contact the authority using provided Phone number on the same page and mention your problem and also mention that you have sent an email with document and not getting any reply, Or just go to the zonal office with all the required documents. That’s it, i don’t think there is another good way to solve this problem. I hope it will help you. And please reply the result here also. Thank You keep Visiting and have a Nice Day. I applied the scholarship in 2017-18,when the results are announced, my name is in the list ,but I can’t get scholarship till now. what I’ve to do now?? Sir, I am taking the post merit scholarship, I am eligible to take pragathi scholarship but whether it effects the post merit scholarship or not. I am 2017 -18 batch and also what is the last date for renewal. i am studying in BE 4th year .i have applied scholarship when i was in first year of my engineering .can i apply now for fresh .am i able to get scholarship. Sir, I’m studying 1st year b.tech and I am eligible for Pragati scholarship. How can I apply for it and when is the last date to apply for it. Please tell sir..
Hello Pallavi, We have updated this Article with Procedure and all other available details. You Can Check out Procedure Here: AICTE Pragati Scholarship Procedure.Now about your second query, we can only say that,”There is no official Last Date announced yet and the application form link is still working so You can apply for it Now. Last Year, application form was online till the month of November/ December. So we hope it will be the same this year also.”. I hope we helped you out, If you are eligible, go for it, Good luck. Thank You for Connecting with us. Keep Visiting Keep Sharing.